Dr. Amy Myers is a former autoimmune patient who has empowered thousands of people to reverse Hashimoto’s thyroiditis, Graves’ disease, and other autoimmune diseases. During my second year of medical school I was diagnosed with an autoimmune thyroid condition and it was honestly one of the most frightening and frustrating experiences of my life. Conventional medicine failed me in my own thyroid journey, and it is my mission to not let it fail you too. After having my thyroid blown up like Hiroshima with a radioactive thyroid ablation, I went in search of the answers that conventional medicine could never seem to provide – what caused my immune system to rogue and attack my thyroid in the first place, and how could I have reversed my condition naturally? 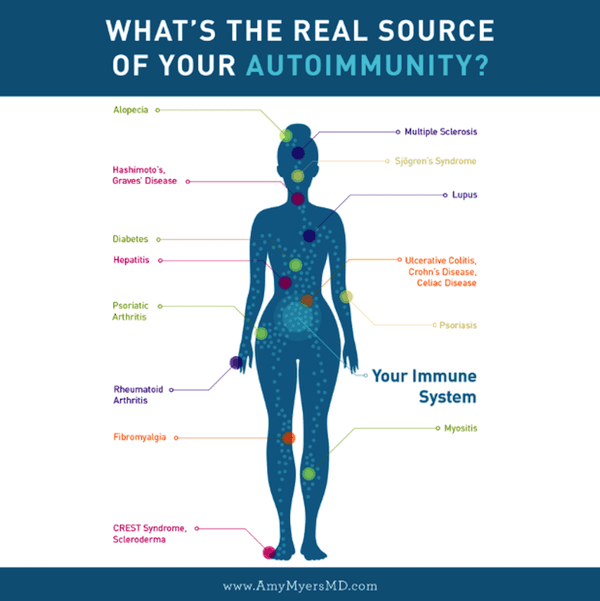 You see, there’s a huge disconnect between what actually causes autoimmunity and how conventional medicine treats it. If you are frustrated by the conventional medicine approach to your health and well-being like I was, I hope this information will help you discover that there is another way to treat autoimmune disease, and you can reverse your condition. If, on the other hand, you are suffering from an autoimmune disease, you will see a specialist who focuses on the organ system that is being affected: an endocrinologist for Hashimoto’s, Graves’ disease and diabetes, a rheumatologist for rheumatoid arthritis; a gastroenterologist for celiac, ulcerative colitis and Crohn’s; a dermatologist for psoriasis; and so on. If you have multiple autoimmune conditions, as many people do, you will see several different specialists, each of whom will likely prescribe a different medication. And, there is a good chance that none of these specialists will look at how to strengthen and support your immune system, which leads me to my next point. In contrast, functional medicine sees the body as a whole and works on the principle that the health of one system impacts the health and function of the others. Instead of focusing on disease symptom management, we focus on supporting and strengthening the immune system by getting to the root of why the immune system went rogue in the first place. 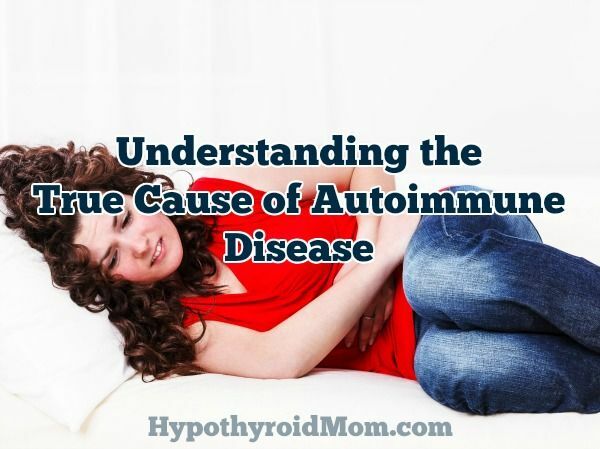 While there is no known cure for autoimmune disease, I believe that there are five key elements that are at the root of all autoimmune conditions. In my functional medicine practice I have been able to successfully help thousands of patients lower and reverse antibodies, get off their harsh medications, and become symptom free. The gut is the gateway to health. It houses 80% of your immune system, and you can’t have a healthy immune system without a healthy gut. Thanks to research from Alessio Fassano (and I’ve confirmed it in my own practice), we now know that if you have an autoimmune disease your gut has become leaky, meaning the tight junctions that typically hold your gut lining together have become loose, allowing undigested food particles, microbes, toxins, and more to escape your gut and enter your bloodstream. Gluten contributes to autoimmune disease in three key ways. First, it is the primary cause of leaky gut because gluten triggers the release of zonulin in your intestines, a chemical that tells your gut lining to “open up”. Second, it is highly inflammatory, meaning it stresses your immune system. Thirdly, the gluten protein has a similar chemical structure to some of your body’s tissues (specifically your thyroid), which can lead to molecular mimicry, where your body mistakes your tissues for gluten and attacks them. Repairing your gut is essential to healing yourself. After all, nearly 80% of your immune system lies in your gut! Functional medicine practitioners use the 4R approach to repair your gut by removing the bad elements (toxic and inflammatory foods and gut infections) that damage your gut, restoring essential elements for proper digestion, reinoculating your gut with good bacteria, and repairing your gut lining. I walk you through this process in my New York Times bestselling book The Autoimmune Solution. For my patients with autoimmune diseases, I highly recommend removing not only gluten but all grains and legumes from their diet. These foods contain proteins known as lectins, which act as a natural pesticide for crops and can wreak havoc on the lining of your gut. Many of my patients find that most, if not all, of their symptoms disappear simply by optimizing their diets to support their immune systems! To make this easy (and delicious!) I have gathered over 150 easy-to-make recipes that are specially designed to prevent and reverse autoimmunity in my cookbook The Autoimmune Solution Cookbook . Here’s a sneak peek. 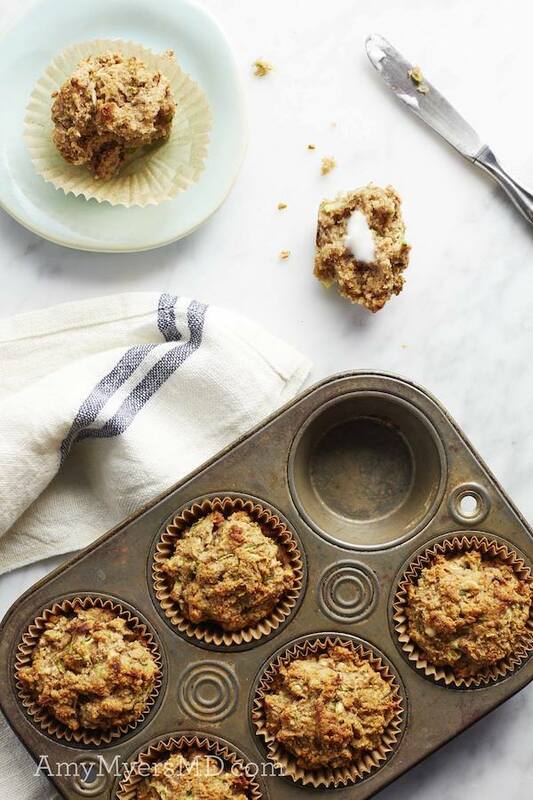 These Zucchini Muffins are my go-to baked goods when we have friends or family over for breakfast. They are so fragrant with cinnamon and nutmeg, you are going to LOVE them! I recommend having your MTHFR genes tested and doing a DMPS chelation challenge test through a functional medicine practitioner to determine if mercury or other heavy metals are an issue for you. Also test to determine if you are being exposed to mycotoxins. I recommend that all my patients find a biological dentist to remove their mercury amalgam fillings. There are a number of bacterial and viral infections that have been associated with autoimmune conditions. Have your doctor test for infections such as HSV and EBV. Monolaurin from coconut oil can be a very effective treatment for both HSV and EBV. Lysine and a lysine-rich diet is effective at treating HSV infections. With our modern lives we should all be prioritizing stress reduction. Take care of yourself by adopting some stress-relieving strategies such as exercise, meditation, art or whatever helps you relieve stress. The key is to find a few practices that work for you and stick with them. Even giving yourself five minutes to sit quietly with a fragrant cup of herbal tea (caffeine-free, of course!) can help tremendously. I never want anyone to go through what I had to go through, so it is my mission to educate as many as I can that there are other healthier ways to recover from thyroid disease. Visit me online at Amy Myers MD. Fiammetta Rubin N.D.— I heard you—Went through it all. for years using Chinese medicines which really helped, but the study can be long.–Then ,4 years ago my stress was so intenseMy eyes had become the spouts of a water fountain.There was a divorce, two moves, loss of my books, thefts in my apartment., from which I had to throw out about 200 books( fire danger)…Anyway, it took me about two or three years to realize that stress, various ” diseases” occurs because we have become afraid of life itself and what it may bring us.—Finally I decided to change my “conscious mind” and FOCUS on positive, joyful, loving . Our bodies are driven by emotions . If we can let go of fear, hate, anger and look at life as a garden where we can survive with others which at times ARE VERY DIFFERENT THEN US, and accept them in their difference, unconditionally, difficult relationships where dialogue is the key as heart opens, shall allow trust, need for joy, SELF LOVE. , SELF ESTEEM, and SELF RESPECT. towards ourselves and OTHERS. THEY shall allow us to be open and express our thoughts and emotions as we share them . Dialogue , sharing with one another our joy of life, even as minuscule, is the only cure , because loneliness and separation from life are the major catalysts of misery. Find beauty in a blade of grass, in the wagging of a dog’s tail, in the eyes of the beloved, etc… and life shall follow because you have opened your door to it.– Namaste. I was diagnosed with Hashimoto thyroiditis in mid 90s. Began low dose of synthroid. Never lost an ounce of the sudden gain of 20 lbs. Debilitating fatigue has been, and continues to be my chief complaint. Dosage has been increased a couple of times, now on 125 MCG. Endocrinologists have all said my fatigue is most likely due to depression. Who wouldn’t be depressed with chronic depression and inability to lose weight? Interesting that I have Herpes I and II, EBV, and CMV. I believe these play a part in symptoms. Sure would love to feel better. I have MS, my other had MS and died at age 74 of thyroid cancer. My son came down with Hashimoto’s and so did I after diagnosed and then had no symptoms. I am the poster child that it’s not the food because I eat really well and know what were void since I heard when diagnosed to stay off gluten; grains lectins(beans), all. Flour Products,Really watch dairy, tons of fruits and vegetables.